PDERS strive to offer a comprehensive and competitive service for London's lifts and are committed to the traditional values of providing superior service, care and respect to all our valued customers. At PDERS the safety of our employees and all passengers who use the lifts installed, maintained, serviced and repaired by our company is paramount. 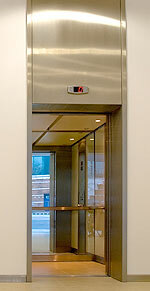 PDERS have attained quality accreditation for the design, manufacture, supply, assembly, installation and final testing of lifts in accordance with the European Lift Directive 95/16/EC. PDERS has a Certificate of Registration under the Control of Pollution (Amendment) Act 1989, (registered waste carrier). PDERS has achieved SAFE contractor certification status in recognition of reaching the SAFEcontractor health and safety standards. PDERS has met pre-qualification requirements appropriate to public and private sector procurement.